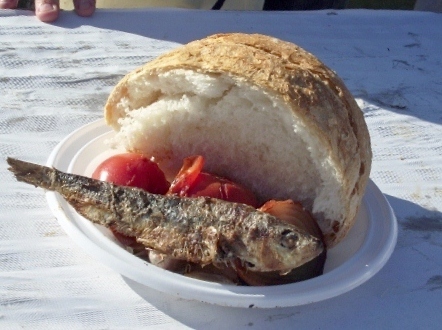 This is breakfast at the Olive Fair in Mora La Nova – the Clotxa. Every year the fair is held to celebrate the olive oil harvest, we missed it last year first time since we have been here, but I went to the Ajuntament and bought our tickets and for 3euros this is what we have. Half a cob loaf with the centre hollowed out a large sardine, tomatoes, garlic and onion plus wine, olives and of course olive oil. So here’s the routine:- you que up hand over your ticket and take your breakfast and bib (oh yes you need it), then wander along and find a table to stand at and eat. This is a community thing and standing at the tables you meet other people. Families, friends and faces you see when out and about who’s names you get to know so you can place them when you wave to each other, really nice. As you can see from the picture it is served in a plastic bowl. This year it came in a covered foil container. When we arrived just after 10am it was in full swing and as you can see not many breakfasts were left. We collected our and found a table. There were a few other people at the table so it was a pleasant morning not cold like some we have been to which makes a difference because believe me it takes a while to eat this and you really do need that bib. People were still arriving and as you can see there was not a lot left, but is that a coffee stall I spy by the door?? It was but very busy so we decided to find another one. Inside the hall the layout had changed. Normally it is crowded with stands and the competition section (this photo) where people make moli d oli a sort of olive oil butter very tasty and good for you. Next to this in the centre of the hall was an olive tree with the various things you need for picking. In the first photograph you can see the ladders which were used simple but practical. in the second jars for storing the oil and in the last one you will see an old-fashioned olive chute something which would help us enormously. It was by the tree that we found the coffee stand and coffee in hand wandered round the stands. This one has won first place before, the trophies are the FIO’s on top of the stand. You could eat your way round the hall tasting all the different oils on toasted bread. There is believe it or not a different taste to each oil just like there is with wine, took me some time to work this out but once we began pressing our own oil it became clear. Further round on the other side of the hall I found AiBar, a little Celler I found with some very nice wines. As usual the cellers also produce olive oil which is very good. First thing was the crusher (or Wesley as my wife named it): We had an old cement mixer that was just lying around which my wife was going to convert into a flower container, but we decided that with a bit of tweaking it could be converted into the crusher by removing the beaters inside and filling the holes to make it leak proof. A day later and job done, now I needed some large stones these were easy to find cleaned up and along with some old petanca balls I had the perfect crushing machine. Second Item was the press: Now this was a little more difficult as we don’t have a donkey or two very large stones so we opted for a small grape press cheapest we could find and we were all set. ​Filtering Department: ​This is done on the kitchen counter and works well. We save empty water bottles and large containers plus Pepsi bottles and small olive oil ones, once cleaned they stand ready to be filled. Then we place the funnels with the filter paper in the bottle neck and scoop oil into the first one. Once this is full we repeat the process into the final bottle and the result is clear virgin olive oil. The large container you can see is a 6ltr water container which the top has been cut off. This goes under the press to catch the oil and is then brought into the kitchen to have the oil skimmed off and filtered. 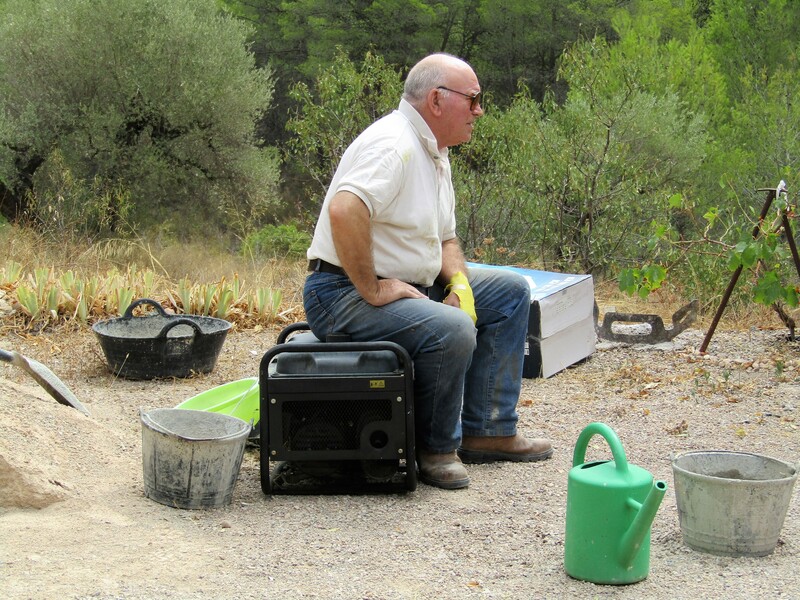 ​After picking the olives we empty the buckets into the crusher turn on the small generator and away it goes. We wait until the olives are pulped into a ‘mash’ then I empty them into a bowl a bit at a time and take them to the press. Here I line the press with an old pillowcase or other clean material making a hole in the bottom so that it will fit over the screw. Once this is in place I put a layer of pulped olives in then cover this layer with some very fine netting and so on until all the olive pulp is in the press. I then add any oil that was in Wesley crusher fold down the pillowcase over the top layer then place the wooden top of the press then come the blocks and finally the heavy metal screw. By now gravity is working and the oil is flowing and I haven’t even turned the screw yet. Once the flow stops I start turning the screw and pressing for real. When the container is half full it is taken to the filtering department (wifes job). Here two bottles at a time are filled with the un filtered oil by placing a funnel lined with good quality kitchen paper as the filter. Next the oil is scooped off the top of the ‘sludge’ and poured into the filters where it drips through as clear golden olive oil. The ‘sludge’ that is left is mainly water and residue so the water gets siphoned off and any oil that’s left is added to the filtering system. The resulting sludge is then taken to the garden and emptied. We have picked the tree next to the house but I am afraid one of the trunks will have to be cut as you can see it is leaning over and although its been like this for years it does not look like it can last much longer… so cutting back part of the trunk will stop it from eventually coming down. Now these photos show the tree at the top of the drive which has not been touched for years as you can see. We picked it yes but Carol would not allow me up there with a chainsaw (wonder why???) So whilst she was out the other day I got ladders and hand saw and began. Didnt stop me being told off for not waiting till she got back (it’s a long drop to the next terrace) but I was fine so whilst she picked the lopped branches (guess who’s chair this is!!) I tackled the other side of the tree. With the result that only those branches you can see are left but until the wind drops off (as fronts go through it gets windy here) they can wait. We have 2ltrs of oil so far from these two trees with another pressing in progress and we are starting on the field today – yes ladders, saws and stuff will be used. We tend to prune as we go for obvious reasons and it works for us. Now it may not seem very productive (lots of oil) but we normally get at least 6 months oil, this year we are hoping for a bit more plus it keeps us fit and the end result is our own oil made with our own hands and a little Heath Robinson thrown in. Oh and as you can see from this picture oil does freeze, yep it gets that cold up here. But I siphoned the water which was underneath this and the oil was nice and clean so there was not much waste after the two filtering. We ended up with 5.5 ltrs enough table oil for the year. So from two happy old pickers its good by till next year. 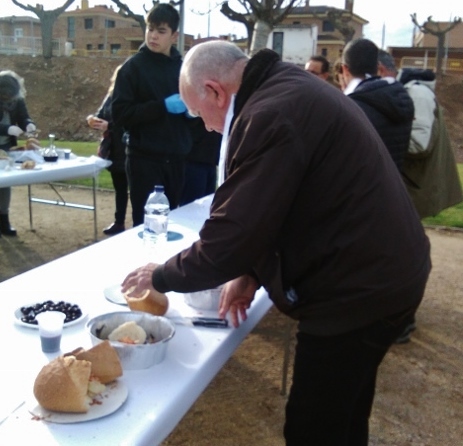 Last Saturday there was a Clotcha (breakfast) at the club and we joined our friends for petanca and food. Now the weather people said it would RAIN, well it did Friday night so the phone was on the bedside just in case things were rained off. But as luck would have it the day started fine if a little chilly and we arrived to find lots of people there, friends from our old club and various villages/towns around. The Alcalde was also there with members of the Adjuntamente, they are great supporters of the club which is really nice. The Clotcha consists of half a small round loaf which you take the middle out of then you fill it with the following bbq’d things:- garlic, onion, tomatoes and either a sardine or sausage depending on your preference, a good helping of olive oil then you toast the piece of bread you took from the middle push it back in and enjoy!!!! Yes you get messy but that’s part of a Clotcha, and it was washed down with some very nice red wine. Next we cleared away had our AGM the played petanca, I was with Jordi and Ramon bless them two very good players landed with me who on a good day can knock spots off balls on a bad day well I should have stayed in bed. But Saturday was a good day we actually beat every team we played. Michael was with Delores and they did the same so it ended up with Michael and Delores being first and Jordi, Ramon and I second wine, olives, crisps and dried sausage came home with us wonderful day. Oh and the weather? well it held until the prizes were given out that was done in the rain – see Sods Law happens lol. Well Jason D’ebre has finished his second children’s book, if you thought that was easy think again. The book might be finished but now begin the rounds of proof reading, editing, description building, re-reading/proofing/tweaking and lots and lots of grrrrrrrs along with the odd ‘did I really write that’ plus the need to get up and wander off. Believe me, whoever said writing was easy was wrong, they probably have no idea what an author goes through. The idea of a story might be easy to put together – provided you have your facts/dates etc., (there are plenty of people out there who just love to pull you to pieces even if the subject is pure fiction. They profess to be ‘experts’ on the subject and know more about it than anybody – and as I said that’s ) but putting it into a story with beginning middle and end is not as easy as it sounds. So from quite early this morning Jason has been reading, checking, ooopsing the book then its my turn. I have to read it make notes of anything I find does not make sense or sound right then back he goes to put things right and so it goes on until we both feel its ok. BUT as anybody will tell you SODS LAW is a writers bane there is ALWAYS something you missed….. so after publishing you sometimes have to go back correct then publish again. With out the army of people a publisher provides to do it for you, this is what a Kindle author/publisher has to do. Jason tells a good story, he checks his facts and knows his history. That’s why the stories he writes are not only readable but interesting. He checks everything but its hard work believe me. Those who just fill pages with words then publish aren’t really authors, they don’t know the first rule of writing THERE HAS TO BE A STORY, without a story line running through it the pages might just as well be blank. Well that’s what has been happening these past few weeks now it’s getting near to my reading the book, so someone is up as head cook and bottle washer as once I start reading I cannot stop. If I have to stop reading and return to reality I lose the times and sense of being there, I tend to emerse myself in the story. This is how I read, it helps me to make the notes for both Michael and Jason. I am very proud to say that because of this I am actually learning a lot of history. At school all we got was battle of Hastings 1066 and all that, but there is so much more to English history as I am learning from Jason’s writing. This time of year sees the local towns and villages having their Christmas Fairs, Tivissa is no exception. So last Saturday evening we set off for the town. When we arrived we found a parking spot and followed the sound of children singing until we reached the old part of the town. Here the narrow streets were packed with various stalls selling christmas decorations, perfumes and soaps as well as pottery, wines, cheese and other food goodies. But it was as we entered one of the squares that the smell of christmas hit us Freshly baked bread and local sweat meats, Michael had to drag me past but I got my way when we passed the square as we left. 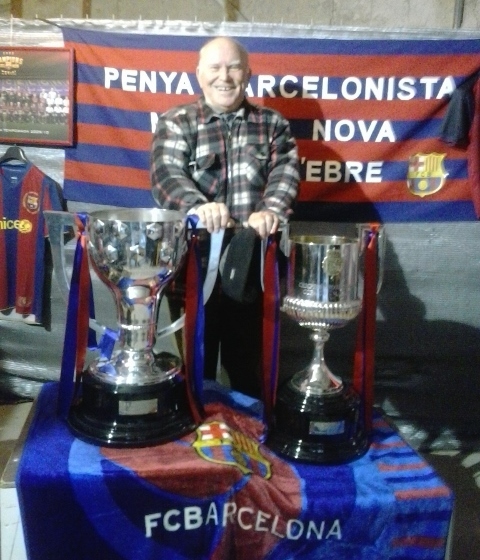 Michael was a happy bunny he found a Barcelona grotto with the La Lega and Champions Cup had his picture taken as well. It was a wonderful evening lifted our spirits and we saw quite a few of our Petanca friends. I bought some wine, bread and goats cheese. But the best part was when we were directed to the church by one of our friends to listen to a children’s choir and orchestra. Trying to describe it is difficult but their rendering of various songs in both Catalan and English brought tears of joy to my eyes and it was very hard NOT to sing along a truly wonderful evening hope you enjoy the pictures. So We then wandered round the stalls and I found a yellow poinsettia so bought that and it came with its own Nadal Donkey then we were looking round and as our 51st wedding anniversary was the following Sunday Michael bought me a lovely artisan necklace it was gift wrapped and yesterday I wore it when we went out. We had a really lovely evening at both fairs. Merry Christmas everyone may it be a happy and peaceful one. They look lovely sweet caring lovey dovey love birds OH NO THEY’RE NOT!!!! believe me. Michael came home from his op and showed them where he had been. (Now I have said this before these birds really help him to relax, when our daughter came to visit they helped her as well). Anyway after Michael had got used to not being able to type or use his hand for a while he would sit there and chat to them all very friendly. So when they had him in a relaxed mood they got him to fix the rope and wood ladder they had been given then asked for something to chew on. He found a nice piece of wood pushed it through the bars so it formed a perch then sat back and watched. Well as you can see they made short shift of that, but he managed to stop them for a while. The bit they were chewing was next to the bars and their intention was to get it to fall to the cage floor once they had chewed through it. But Michael pushed the wood through so that bit was now in the middle and this is what it looks like now. Now for a long time I have also been watching the olive trees and they are loaded so we have been looking at a good harvest and our own oil for next year. WRONG… because we have not had any rain (I mean proper rain the sort that soaks into the ground) for over 6 months the olives have formed but when you touch them they are basically stone covered fruit, no flesh to produce any oil. So bit disappointed but then we have had this before, and it will give me time for some pruning. I am just hoping that it rains between now and Christmas or we could be in a bit of a pickle water wise. 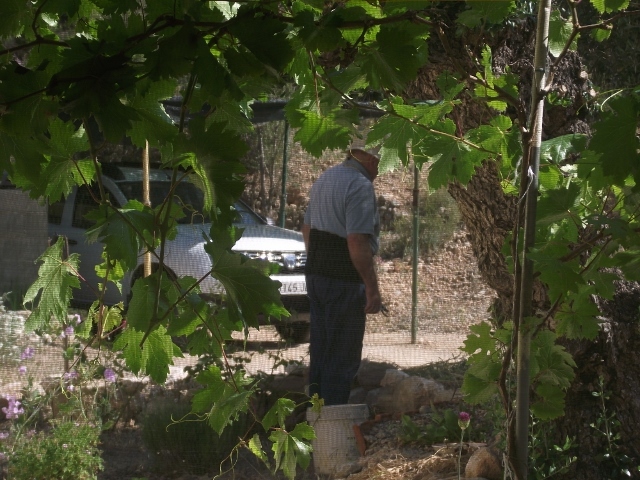 Yes I know we chose this finca knowing all the problems but we are told it has been the driest year since 1924…. We did have a few almonds though enough for cooking and Christmas. The garden is looking good for the conditions. I have cleared the Cacti garden and planted a few more it’s looking quite good up there. My wife has cleared away most of the dead leaves from the beds. She found that during the hot weather they help to keep the ground from turning into rock, it doesn’t always work but it helps. Together we have created a small Bougainvillea garden next to the little house and I built a small wall so she can build up the soil around them and hopefully they will again survive the winter. The white stuff is their ‘winter blankey’ which along with some bubble wrap will keep their little roots warm. Now begins the deciding where to put the ‘water tanks’ she is making for the various beds/flowers and to prune the roses. She cut the lavender back and we now have a nice new lavender pillow to hang over the bed. For those of you who don’t know this is Sam. He was the little Black Redstart who followed me around the garden and played hide and seek in the tree. We found him laying dead on the gravel one afternoon when we returned from petanca, to say it broke my heart was an understatement. This little chap had provided me with hours of fun and Michael was fascinated by the antics of this little wild bird. So I decided that I would re-do the center and surround of the olive tree next to the house and call it Sam’s Garden in his memory. To begin with I thought to leave the tree garden as it was but viewing it in flower last spring I decided that it needed some filling and just a little tweaking, so here’s what I’ve done. These two photos are the ‘before’ ones showing the garden before I got going. As you can see the tree is very old and divided into three parts. The front two face the house with the third trunk facing the drive. Now unfortunately olive trees grow lots of shoots which have to be cut off and these are no exception, so snipers in hand I got stuck in. Whilst I was at it I rebuilt the small wall at the base of the little slope then made another at the top forming a small area that I can grow Nasturtiums in and let them tumble-down naturally. Then I turned my attention to the front part. This faces the rose garden, and what a surprise I had, there poking their heads out were two snowdrops. Now when I dug up the lilies which were taking over – only the small clump remains – I found lots of small bulbs in them but didn’t know what they were so I simply replanted them and hoped they would grow. I had originally planted snowdrops and crocus Michael had bought me but only saw a few crocus appear. Now I know why so am hoping for a small show next spring. These two photos show the ‘after’ look. In the first one you can see the small wall at the bottom of the slope and the new one at the top. The clump of leaves in the centre are wild Grape Hyacinths, these grow everywhere and I am constantly digging them up and re-planting them. The second photo shows the drive side and the clump of wild asparagus I found. Last year Michael decided that the trunks near the house would look good shaped like saucers and we could leave the back trunk for the birds to play in, so saw in hand he set too. The result is quite good and as it grows we can shape it into shade cover for the bird bath and strawberry patch. Ok take a look at this. This my gardening friends is Wild Asparagus. It grows around the olive trees and in the forest, so I have cut it back to ensure it produces the tender slim shoots that taste heavenly and make a really tasty omelet. I shall be wandering round the fields snipers in hand cutting back any I find to ensure we have a good supply. The season only lasts for a short while but mmmmmmm worth work.